Interested in living near Ryan Lewis? Word on the street is that Macklemore’s partner just bought in Magnolia and not too far from this Magnolia view home either. Carleton Park is highly sought after and this one has one of the most gorgeous views! If you have been looking at Magnolia view homes, then please take a minute and look at this one. It is a perfect home for a Seattle Mariner baseball player (hmmmm… I think Mr. Moyer would agree. ), but also well suited for anyone who wants to call Magnolia home. You will find this large, contemporary home well-placed on one of Magnolia’s most sought-after streets. Enjoy the warmth of two hearths on the main, oak flooring throughout, designer Ralph Lauren paints, modern floor plan, and tasteful finishes. Chef’s kitchen properly outfitted with stainless appliances & gas range; entertainer’s deck off of the living room invites you to take full advantage of the beautiful Puget Sound view and fresh breeze that grace this desirable location. Stunning Eastlake Seattle floating home for sale and new on the market—2 bedrooms, 2 baths, bamboo floors, new windows, new exterior paint, roof top deck, window seat, room for your small craft or water toys, LARGE 10 x 4 ft kitchen island for entertaining & a cook’s dream! For Your own private showing or for more information on this Seattle floating home or other Seattle houseboats, please get in touch with Seattle floating homes Realtors Courtney Cooper (courtney@cooperjacobs.com) or Molly Cartwright (molly@cooperjacobs.com or 206-841-6800) of Cooper Jacobs Real Estate. If you are interested in other Seattle floating homes for sale, we would love to show you what is available besides this beautiful property. Welcome home to one of the most exceptional estates in Seattle with arguably the best views in the city. What’s happening out there in the upper end of the Magnolia real estate market? Currently, there are 15 Magnolia homes for sale in the Magnolia luxury market. These Magnolia estates range in price from $1,575,000 to $4,850,000 and include a certain ex Seattle Mariner Mansion. The median price is $1,730,000 with an average days on market of 165 days. The average square feet of these Magnolia Luxury Homes? 4,549 with a high of 7100 on one of the Magnolia luxury estates for sale. Currently, there is only 1 Magnolia home for sale that is Pending in the $1.5M and up range. The days on market for it are 149 days and it’s last list price in the NWMLS was $1,585,000 after being reduced from its original listing price of $1,687,000. Overall look at Magnolia luxury markets and Magnolia historical estates markets: Funding for these types of homes has opened up to the point that affordability has broadened making Magnolia luxury homes and Magnolia historic Mansions more desirable than they have been even in the past if that is possible. We toured all the latest in Seattle’s Magnolia neighborhood as well as some other Magnolia homes we have just been too busy to get into before today and the inventory is pretty interesting on both the A Hill and the B Hill. Just looking at the mid $600k range to mid $800k range in Magnolia can give you choices with lots of big Puget Sound views. In fact in the low and mid $700k range, there are IMPRESSIVE Magnolia view homes for sale. My favorite Magnolia home on the market right now is in the high $700k range, but has this fabulous 2 car garage off the alley which is modern but was built perfectly to go with the house. The house itself is loaded with all the spaces I personally look for in a home and a great option for Magnolia buyers. Homes in Magnolia do tend to sell faster than Seattle real estate overall right now. This is not always the case, but overall Magnolia tends to be a stronger market force. Magnolia real estate market update: We just sent out a postcard to about 1300 Magnolia homeowners to let them know about our latest Magnolia homes sale – 3 weeks on the market with multiple offers and sold for over list which happened to also be about $50k higher than any other Magnolia real estate agents told the seller their home was worth. We go the extra mile for YOU and really take the time to evaluate the market value of your home so that you are not leaving money on the table. 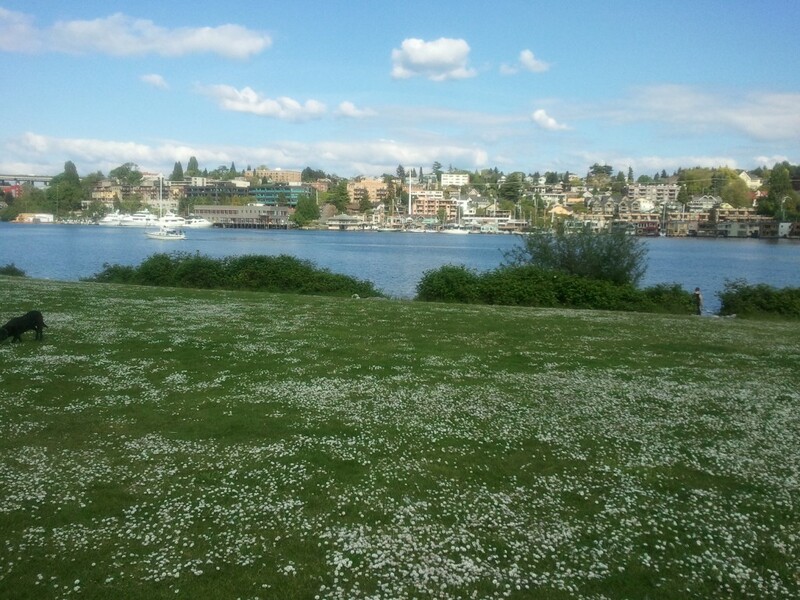 Yes, I do love Lake Union! Here is a great shot I got of Lake Union from Gas Works Park while I was checking out the collection of stand up paddle boards at Urban Surf (they have a great selection of SUP boards along with all kinds of other great gear) on Northlake….. You can see over to the right across the lake the colorful Seattle houseboats at Roanoke Reef. I love the flowers on the ground! Let us know if you are interested in looking at Seattle houseboats for sale. Are you interested in Lake Washington Homes? Lake Washington is much bigger than many people realize and it touches the shores of many interesting and unique communities…. Lake Washington waterfront homes vary in size and style and no two seem to be the same. One thing that is consistent is the fabulous access to Lake Washington. This is only a small sampling of some of the many communities along the banks of Lake Washington. Let us know if you would like to see some of our favorites! Congrats to Cooper Jacobs Broker Morgan Cooper and his clients! If you are interested in Laurelhurst Real Estate or other Seattle real estate, please feel free to get in touch with one of our real estate brokers.